Great for any game -- you will love playing with this deck hand after hand! Summary: Inspired by stars and galaxies of the night sky! 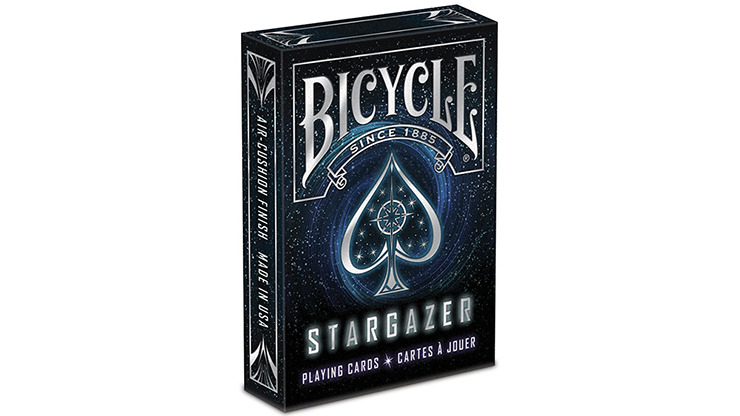 The stunning silver foil on the tuck box immediately gets us thinking about the sparkle of stars in the night sky. 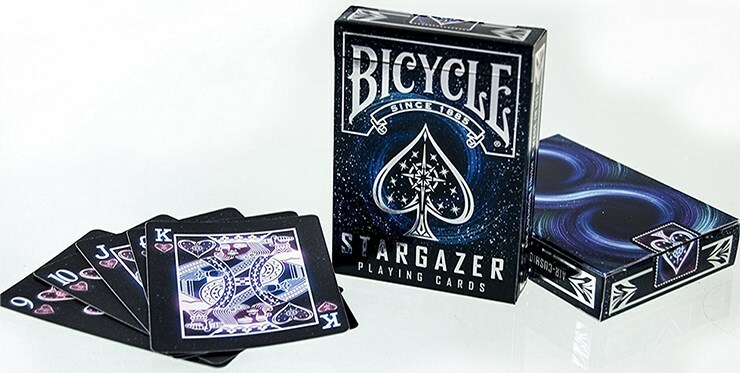 Designed by Juniardi Satyanagara, the card backs feature a figure eight shape incorporating two black holes. Theswirling shape amplifies a sense of motion when twirled or spun. 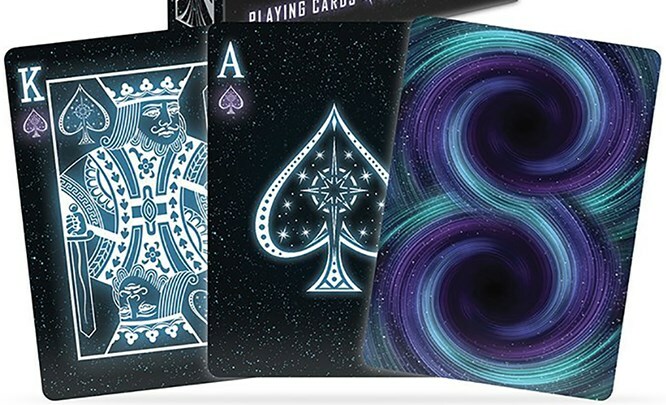 Card flourishers can use fans and spreads to maximize the effect of the glowing colours that go to the very edge of the cards. The use of a black canvas as the background of both the faces and backs enables an unusual yet beautiful palette of colours to shine, and looks like eye-catching illumined signage. White, pink, and purple colours work together beautifully against this black backdrop, ensuring that the uncommon colour scheme doesn't sacrifice visual clarity of the indices. 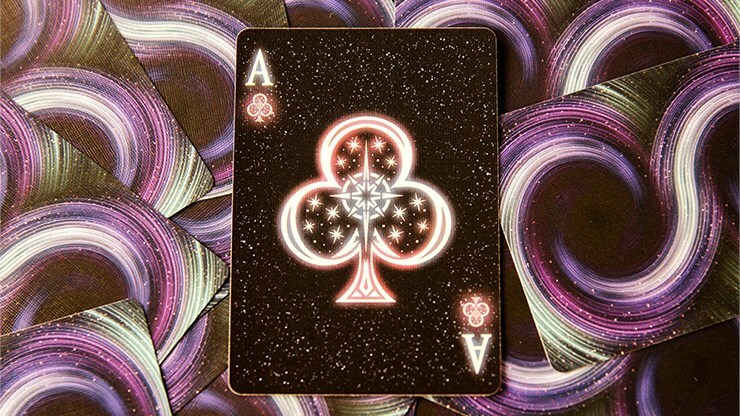 The court cards feature a burst of light touched with purple and pink, clearly inspired by a classical design transported to a colourful starry night sky. The matching Jokers look like magnificent visions that have stepped straight out of the night sky. 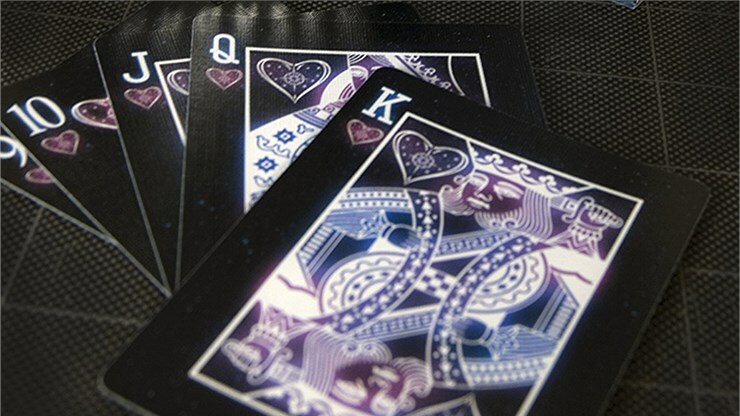 While the large pips on the number cards feature a combination of pink and purple colours, the indices use a binary choice of colour, with Spades and Clubs having purple pips, and Diamonds and Hearts in pink.